Being regarded as the most trustworthy and reliable automotive brand in the world, Toyota has always impressed its followers and auto geeks with its exceptional productions that have continued to rule the world since their existence. Each and every aspect of the vehicle has always been on the topmost priority for the automotive brand during the development of the vehicles, which is why it is at the highest peak against other brands. 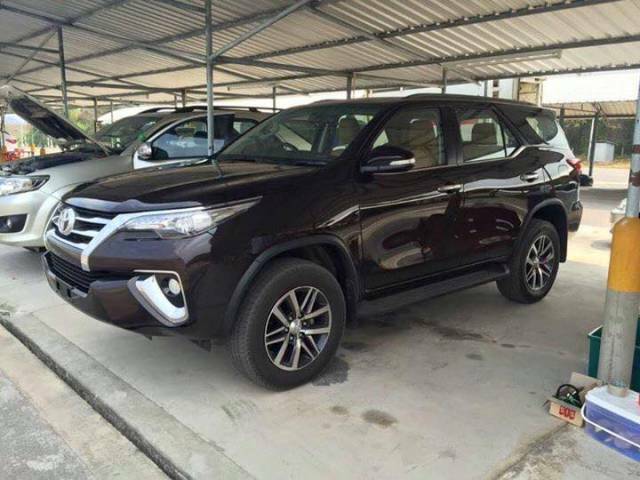 Toyota Fortuner is no exception when we talk about the design, engine, power, luxury and comfort. However, the brand has gone a step higher, this time, around with the sporty version of the Fortuner 2016, which looks absolutely ravishing. The Toyota Racing Development has done every bit of it to make it look even more alluring and thrilling, and yes they haven’t disappointed us. Launched earlier this year in Thailand, TRD Sportivo Fortuner is expected to make its way to the country soon. Here are the following fundamentals you would be interested to know before witnessing the muscular SUV at the show itself. The Toyota Racing Development (TRD) has granted the 2016 Fortuner much more than just a sporty kit. The sporty version has a black hued front grille, black matte roof and revised front and rear bumpers with body-colored lips. The TRD Sportivo tag has been engraved all over the SUV including the tailgate, steel exhaust pipes and on the black 20-inch alloy wheels. The suspension of the sporty Fortuner has been upscaled to fit all kinds of uneven terrains and provide supreme driving pleasure to both, driver as well as the passengers. The addition of fine springs and shocks allows the Fortuner to maneuver around the streets swiftly and grant a pleasurous drive on the high-speed roads. The sportiness of the cabin has been enhanced to a new level, which accounts for the red and black dual-tone over the seats, door panels and the dash. ‘Carbon kevlar’ trim adorns the steering wheel and the gear knob while the specially designed instrument panel with the standard TRD Sportivo logo adds extra marks on the magnificence of the Fortuner TRD Sportivo. The sporty version carries over the same 2.8-litre turbocharged engine from the standard model, which being mingled to a 6-speed automatic transmission system can churn out a max power of 177 hp and a peak torque of 450 Nm, that’s what fascinate the auto enthusiasts. Being the best selling SUV from the fleet of Toyota available in sporty trim is certainly an icing on the cake for the auto lovers who die all their lives to make such a vehicle a part of their garage.